This test is based on a research about primate cognition by the Primate Research Institute of Kyoto University. * Chimpanzees, like Ai and Ayumu, have been trained to learn Arabic numerals (Levels 1-2); then, their eidetic memory was tested (Levels 3 to 6), giving astonishing results and proving better performances than humans'. LEVEL 1 is designed to guide the subject in the learning process of a new numeral system. LEVEL 2 consolidates the correspondence between symbols and their value. 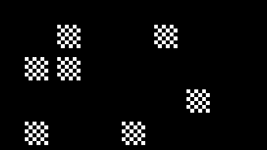 LEVEL 3 tests the subject's memory; after touching the first numeral, the others are hidden. The subject is asked to remember which numeral appeared in which location, and touch them in numerical sequence. LEVEL 4 is designed just like LEVEL 3, but numerals are automatically hidden after 650 ms from the start of the test. LEVEL 5 hides numerals after 430 ms.
LEVEL 6 hides numerals after 210 ms.
Ayumu could easily score 608 on this test (i.e. 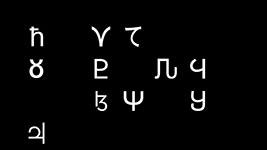 Level 6, 7 numerals). Untrained humans can barely score 506 (i.e. 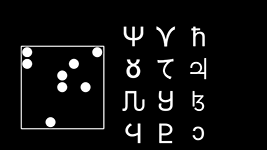 Level 5, 5 numerals). It's noteworthy that children have shown better results than adults. Could this be improved by training? Ayumu can score 80% on EACH level in ORIGINAL TEST MODE. 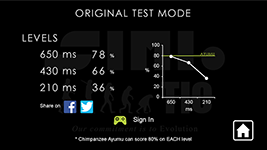 ** for more information about the original test: Working memory of numerals in chimpanzees (PRI Official Site).